Polled heads and natural dehorning is an important part of the breeding program now at Ja-Bob. We are now producing 20-30 polled red bulls per year that are worthy of use as breeding bulls. If you need polled red cattle, call Ja-Bob. Embryos exported to Canada Panama and Ireland. Wunder Hollie now resides in Canada at Falona Springs. Daughters by Golden, McGucci and Kad. Includes a Red Polled McGucci daughter! Redburst daughter at Curtis & Raven Throne in MO. Roxy Family 8th Dam is Roxy! Homozygous Polled sons in AI Ja-Bob Robin-PP-RED at ABC Genetics and Ja-Bob Rex-PP-RED at Triple-Hill Sires. Other Important Polled Females at Ja-Bob! 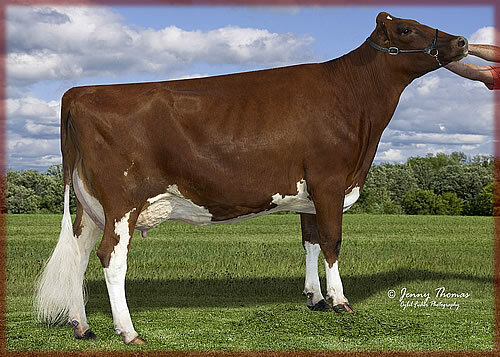 138H54755 Ja-Bob ROBIN-PP-RED at ABC Genetics - ROXY EX 97 Family!